When we bought our home, having a finished basement was definitely a huge bonus that we hadn’t even considered. Most of the homes we looked at barely had 3 bedrooms, let alone a finished basement. To be honest, it was one of the big reasons we fell in love with our house. We got SO much ba-BAM for our buck! I know, I know. “Man cave” is SO gender-normative and patriarchal. But tbh, as hard as I have tried to force us to call our finished basement space “The Media Room”, as a gender-neutral alternative, “Man Cave” has unfortunately stuck. Oh well. Some things never change. Our finished basement area isn’t the biggest space in the world, but it’s a cozy little escape from the rest of the house. I love the idea of having a media room–somewhere where we can stretch out, watch movies, play video games (Evan will), listen to music, read, have a beer, etc etc. without having to feel pressured to keep the space tidy since it’s not part of the main flow of the house. Another great benefit to our man cave is that it stays about 10 degrees cooler than the rest of the house, which is a welcome oasis during the hot, summer months in Atlanta. I picture us spending lots of time down here during the summer, binge-watching Netflix or listening to a record while curled up with a book. The man cave was the first space I started dreaming about as we moved in, actually. Weird right? I guess I just knew it had a lot of potential to be awesome. I pictured a moody room, inspired by cigar rooms, hunting lodges, speakeasys and whiskey lounges of the 20s and 30s. We still want to make sure that the space feels modern and classic though, with enough quirk to make it ours. This small space will pack a powerful punch of design, mood and style! We’re currently in-progress on painting, so I don’t have current “before” pics, but here are a few shots from the listing for our house. There is a small, weird powder room that separates the man cave from the laundry area, but we’re ignoring it for now. We have bigger plans for a larger renovation in the basement in the future, so we don’t want to waste money on a powder room that is definitely going to change. 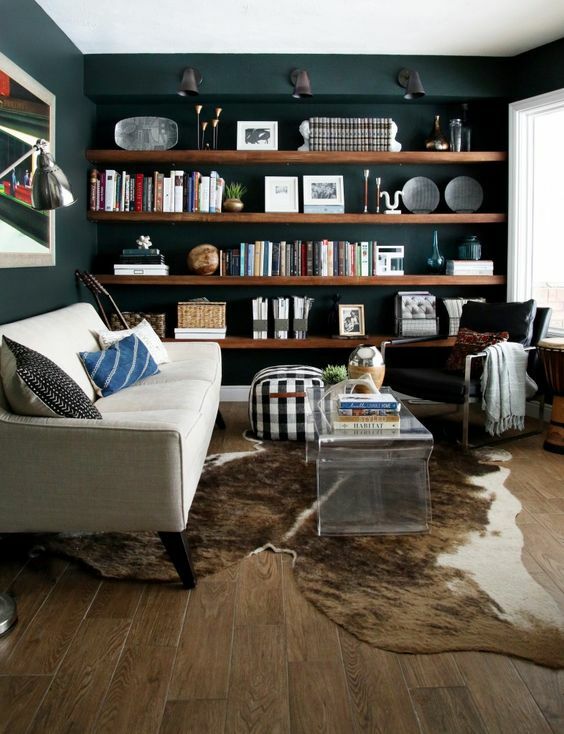 But some paint, a great sofa and some style can definitely make it a great space to enjoy until then. But okay, real quick–can we talk about the paint choices here? WHAT ON EARTH?! Guys I just don’t understand. Why. Baby freakin’ blue and, as Evan has affectionately named it: zombie-skin-green trim. I can’t with this paint. I just can’t. But overall, not bad. Again, it’s not huge. The weird door in the last picture goes to the unfinished part of the basement which we use for storage and tools right now. The doggie door is weird (why?). No official plans to replace that door yet because, money. But it will change. The floors are great though! They are faux wood tile: so super sturdy and easy to clean and care for. We have already replaced the door pictured above. The all-glass door was nice for extra light, but we just didn’t feel comfortable having just a glass door as an exterior door. We have since replaced it with a craftsman style door with a few small windows at the top, which let in some light. Either way, we’re not too worried. Again, the idea is dark and moody, cool and secluded. 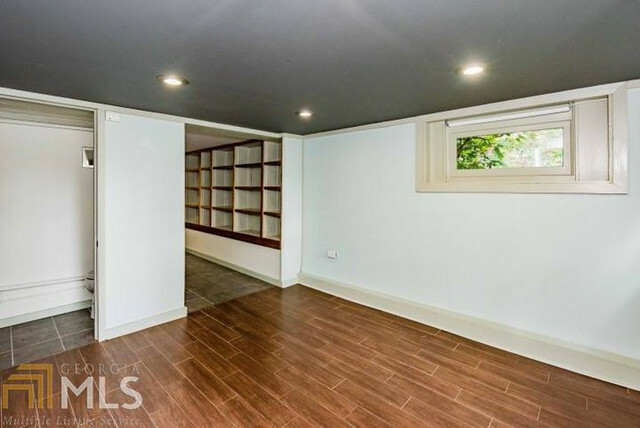 In these pictures, you get a little tease of what made me fall in love with this house: those original built-ins! Aren’t they darling? As soon as I saw them my heart skipped a beat and I started dreaming of making that space a pantry for all of my dry goods and canning projects! But they also inspired my choice of paint color: dark navy. I love the pine trim around those shelves, and I love the original caramel stain too. It feels very warm and lends itself to orange/yellow hues, so I knew that painting the inside dark blue would really make the pine pop. The plan is to continue that dark navy into the man cave area, too. Without further ado, here is some of the inspo! I know it’s odd to have a bedroom as inspiration for a living area, but I was so inspired by all of the texture in this image. The fur, jute, brass and wood are all blending together so well. Also OMG those pillows. I will be ordering some for the man cave, stat. The next image is from one of my favorite blogs Yellow Brick Home. I absolutely adore their fun, eclectic style. When I read about Kim & Scott’s funny little nook, I was instantly inspired to create a similar space in our home, and the mancave fits the bill. I actually ended up choosing the same paint color they used in this room: Narragansett Green. Last but not least, this living area from Chris Loves Julia was another big influence for me. Since Evan is from Texas, I definitely wanted to do some sort of nod to his roots in this room, since it will be his video game retreat. The cowhide rug feels like the perfect way to do so without having to hang a huge Texas flag from the already low ceilings (sorry babe). 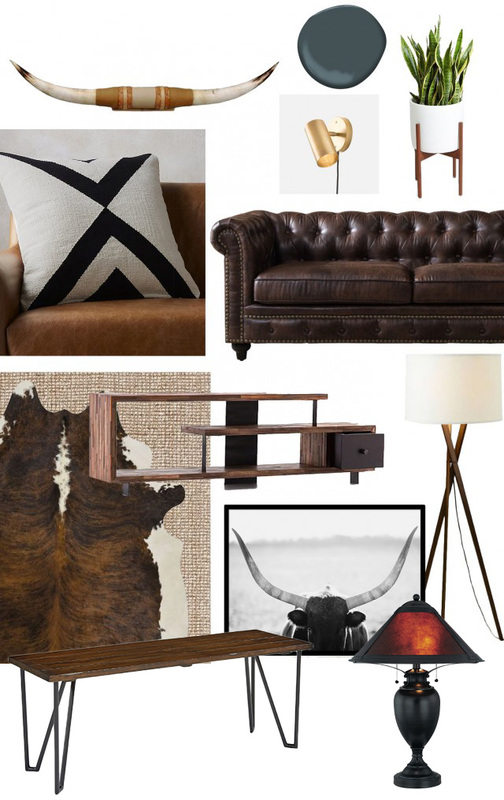 I think that we’ll want to layer the cowhide in our space over a thicker jute rug for extra comfy toes. I also love the lucite table. Since the space is small, having clear objects will definitely help make the room feel less crowded or blocked off. With all of this inspiration, I felt like I needed a moodboard/shopping list for the Moody Modern Mancave to refine our vision. The mission of this space, again, is to be a place to enjoy media–music, tv, books, etc. It’s a place to unwind, spread out and get cozy. I picture us possibly even laying out on the floor, kind of like when we were kids and would have movie nights. All in all, it should be a fun space to be a grown up kid. First off–the sofa. Since I was a teenager, I have always loved Chesterfield sofas. They are the epitome of class and power to me. The problem was always cost–they can run anywhere from $1,000 and up. Since this isn’t our main living space, I just couldn’t justify spending that kind of $ on a sofa. But then–Magic. A friend reminded me of At Home, and I decided to look and see if they had any chesterfields. Sure enough, they did!! We managed to snag this one for $600. It’s faux leather, but no biggie since we’re probably too rough and tumble for a real leather sofa at this point in our lives anyway. It’s absolutely stunning, the leather is soft and it’s pretty comfy! I love stretching out on it while Ev plays video games. It’s awesome. Speaking of great deals, Home Goods came to the rescue again! We found both the coffee table/bench and the end table there (not pictured). The coffee table is actually a bench from the Magnolia Home collection, and we snagged it for $100! I love that it could double as additional Friendsgiving seating if we really needed it. The end table has the coolest hairpin legs that pair so well with the bench, too! I included a similar image of our Mica Mission-Style table lamp that we plan to incorporate into the space. We love this lamp soooo much. I scooped it up on a random trip with a friend to a storage unit sale for FIFTEEN DOLLARS. It’s in great shape and has lived in many rooms in our various apartments over the years, but I am excited for it to find a more permanent home in this space. The biggest challenge I think for us will be finding a console table that works well with the rest of the furniture. I am inclined to get a vintage 60s buffet table, but they often have a lighter stain, and most of the furniture in the space is more of a dark brown. While I’m not afraid to mix and match different wood finishes, I’m not sure if that approach will work here. What do you think? Should I go for it, or stick with a dark finish? All in all, that’s the gist of it! We still have a lot of work to do and things to buy, so it might be a while before I have a wrap up on this space, but I’ll definitely share as soon as we deem it done. Stay tuned!